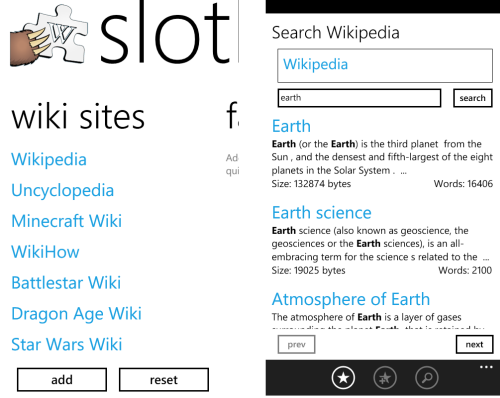 UK-based Amused Sloth today announced the release of the updated version of Windows Phone 7 application Slothcyclopedia. What makes it special is that it gives you the opportunity to have tons of knowledge at your fingertips. This application is the best tool one can have to explore the vast knowledge available on Wikipedia and other wiki sites. View articles from Wikipedia, Uncyclopedia, WikiHow and a few other online encyclopedias. Save their favorite articles and view them offline. Keep a history of the read articles, so they can easily come back to them. Add their own wiki sites to search and explore. The app costs $0.99 or you can download free trail. To download the app, just search for it in Marketplace on your mobile or download via zune HERE to your desktop.